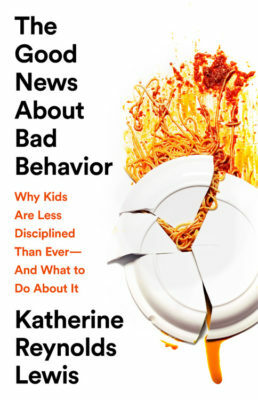 Journalist Katherine Reynolds Lewis’s inaugural book, The Good News About Bad Behavior grew out of a 2015 article for Mother Jones called “What If Everything You Knew About Disciplining Kids Was Wrong?“. The promotional material claims it was the most read story the magazine had ever published; The Seattle Times‘ Claudia Rowe relates that it got more than four million hits. That’s a good clue you ought to get to work writing a book for someone to sell. Which Lewis did. This book, subtitled “Why Kids Are Less Disciplined Than Ever—And What To Do About It” or in some editions, “Am I So Out of Touch? No, It’s The Children Who Are Wrong” might be the most important book ever written considering what we’re up against with Kids These Days. The children and youth of today are worse now than they’ve ever been. This isn’t just a feeling but borne out by measurable, quantifiable metrics like rates of homicide and suicide, teen pregnancy and abortion rates, or smoking tobacco and drinking alcohol in the past month. And there’s clear, straightforward evidence that having so much screen time is ruining the ability of the coming generation to exert self-control. That includes near constant contact with social smartphone apps as well as video games like Fortnite, so uniquely addictive that youths are content to watch someone else play them rather than play them themselves. Actually, if you click through the hyperlinks, in all those quantifiable ways children are doing much better than a quarter-century ago, and largely healthier and better behaved than their peers of 1980 or 1970, too. Turns out, eliminating omnipresent lead poisoning may have been a pretty good idea. To be clear: even better than millennials, today’s youth forego lasting (and let’s call them “real”) problems; meanwhile, video game addiction does exist but is exceedingly rare. So, the kindest thing we can say about Lewis’s book is that its premise is of … specious validity. Luckily, you can treat the first three chapters or so as vestigial and the remaining seventy-five percent does hold up without it just as well. To try a different premise: “Good parenting is hard, and you want to raise your children not to be obedient or manageable but with an eye toward them becoming independent, competent adults with self-discipline” — that’s evergreen material and shouldn’t need dire warning to justify itself. The trouble is that parenting books, like self-help, dieting, and wellness generally, tend to be akin to the Greek satirist Lucian’s criticism of diverse philosophical schools, all promising to lead travelers to a far-off City representing enlightened bliss, but each guide pointing in a different direction to get you there. The anecdotes and acronyms of PEP (Parental Encouragement Program) and PAX (Peace, Productivity, Health, and Happiness) are things you mostly have to take on faith that they’re legitimate and work, but why shouldn’t they? The goal is self-regulation; to do that, you need to make connections with your children, communicate with them as autonomous individuals worthy of respect, and systematically build their capability as those individuals. So rather than get into a power struggle about what you want them to do — like taking a bath — explain why they ought to do it, warn them that they’re going to smell bad later so you might not want to read them a bedtime story if they’re in your lap and smelly, then follow through on it. They deserve to make some low-stakes choices, and then to deal with the consequences of those choices. Or if they’re an older sibling, you could put the child in charge of making sure younger siblings have sorted their clothes for the wash so that they learn to have a sense of ownership and pride in the accomplishment of a chore. This is the apprenticeship model, and hopefully they graduate from your home with the skills necessary to survive out there without you, capable of many skills but most importantly, capable of failing and not being crushed by it when they do. This all sounds inoffensive, and even worthwhile, healthy, and productive, both to you as a parent and to a child being trained to live out in the world on their own. It’s also probably no more than marginal in its effect. If, like Lewis, you can afford to send your children to the private school of their choosing because you don’t care for the public school classrooms you were allowed to observe, you’ve already helped your children in the most important way possible in America: start them out wealthy. The biggest takeaway we get from Lewis’s original, viral article is that she treats the school-to-prison pipeline as the system not working as intended when she ought to view it as the system working exactly as intended. No amount of immaculate parenting or educating is going to meaningfully impact zone- and wealth-segregated schools or the prison-industrial complex. On that level, it — and the book, also — fail. But in terms of raising your own children, if you are in a relatively good position, who knows? This could actually be the parenting strategy that works out. © 2019 The Northwest Progressive Institute. The Cascadia Advocate loaded in 0.198 seconds.